I am not a longtime fan of Wonder Woman. I never read comics as a kid. I didn't have a Wonder Woman costume. For much of my life, I vaguely knew that she was a part of DC Comics. 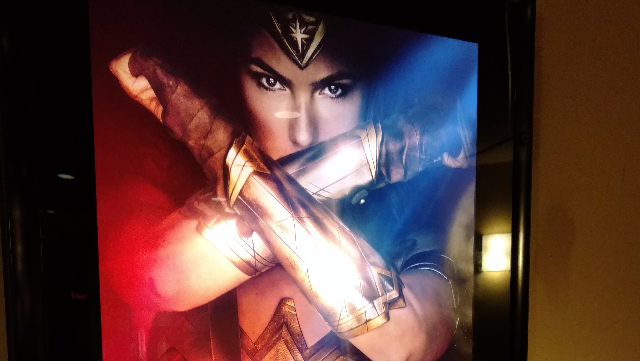 I admired this heroine with her lasso of truth from afar, but that was all. My childhood heroine was She-Ra, another powerful princess who was also a superhero. She-Ra led a rebellion and defended the Crystal Castle. Her power and costuming were impressive, but I found her appealing because she was a woman and a hero. She-Ra showed me, and plenty of other little girls of the 1980s, that women could be heroes, just like Wonder Woman had for generations of girls and women before me. Something happened, though, when I watched the trailer for Wonder Woman (2017). I not only wanted to watch this movie; I also wanted to be a fan. I wanted to see Princess Diana transform into Wonder Woman. I wanted to see her become a hero. But I also was a little afraid the new film would disappoint. That the 2017 version of Wonder Woman might be as terrible as the recent versions of Superman and Batman. That she wouldn't be the hero we needed, but only the lackluster hero we seem to deserve. The film opens with the Amazons, a group of women warriors who live in isolation on the island of Themyscira. They train for a war that might never come, to be ready if it does. There are no men on the island, and they are ruled by a queen. Matriarchy appears on the big screen, and I wasn't prepared for how emotional my reaction was. I was in awe of the Amazons: their physical prowess, self-rule and unrelenting confidence in themselves and their cause. As I watched these mythical women, I realized something important: The Amazons showed viewers a world without patriarchy. The Amazons didn't have to live under patriarchy. They didn't know how it felt to live in a society that doesn't understand women as fully human. They didn't know what it was like to be ruled rather than to rule. They didn't understand the exhaustion that comes from being women in our society. They didn't feel the toll of sexism, misogyny, harm and violence that women experience because we are women. They didn't know the heartbreak of being told anything is possible, only to find that gender limits your choices and options. I started crying as I watched these fierce Amazons because it was only an ordinary Tuesday and I was already exhausted from being a woman in 2017. The fantasy of the matriarchy was so tempting. I found myself mourning a world that never existed but I fervently wished had. The matriarchal fantasy can't last, unfortunately, as a man crashes his plane into the waters surrounding Themyscira. Princess Diana saves his life, which has unforeseen consequences for the Amazons. German soldiers with guns arrive on the island, and Diana soon learns that humans are at war with one another, perhaps a war to end all wars. She decides to leave the Amazons to go save humanity. In the human world, Diana encounters the early 20th century and sexism, which she can't seem to be bothered with. Men tell her what she can and can't do as a woman, and she ignores them. Their mansplaining doesn't affect her commitment to her mission. What's striking about Diana is her confidence and determination, but also her compassion and empathy. The men around her are jaded about war. They talk about acceptable losses. They emphasize the greater good, which means some people are going to die. They try to tell her who she can save and who she can't. Diana doesn't understand the war that's being waged. She can't understand the distance of battle offered by sniper rifles, bombs and poisonous gases. When Diana discovers there's a town full of people who are starving because their supply lines have been cut off by a nearby battle, she chooses to act. Her compassion for these people makes her step away from her mission to save them. In a pivotal scene, Diana transforms into Wonder Woman and crosses the no man's land between combatants. Bullets bounce off of her bracelets. She's fierce and beautiful, and she's doing what the men wouldn't do. The no man's land becomes hers, and she becomes a hero. Watching Wonder Woman become Wonder Woman made me catch my breath. She made me want to be brave and compassionate and confident and empathetic and uncompromising. As she fought to save the town and all of its people, I teared up again. For a moment, I thought Wonder Woman was what all women could be in a world without patriarchy. Without limits, we could all be heroes. As the film ended, I was ready to take on the world. I was energized. I wanted to be brave and compassionate like Diana. I instantly wanted to watch the film again. Wonder Woman showed me that compassion is necessary, not an afterthought, and that women can save the world. And now, I wonder: Will we?